I do a lot of stuff. Actually too much stuff but I am totally woking on that saying “No” thing. Hey, I’m getting there. Two days ago I finally earned my fourth stripe on my white belt in Brazilian Jiu Jitsu. For those who don’t know, in BJJ, you are a white belt forever. It takes anywhere from a year to a year and a half to earn a blue belt. My next level is blue belt and I am stoked. In BJJ, the blue belt is almost as big of a deal as black belt because most people never get that far. I am no angel. My life gets out of control, too. But, I can say that these periods are far shorter than they used to be because I have learned solid principles that work. When my life feels like it has been tossed in a blender? It means I am no longer in the driver’s seat. I am allowing other people’s agendas to bleed into my life and I am mistaking the urgent for the important. If I have to pay a bill and they put me on hold? I read research, fill the cat bowl, or jot down ideas for blogs. I know I can’t write 12 hours a day and that being active keeps the tendonitis away. So, I take Brazilian Jiu Jitsu with Spawn. We get a good workout and Mommy-Kiddo time. Focus increases confidence, offers a sense of authentic accomplishment and relieves anxiety. Focus will also free up time for more fun stuff (and more writing). Activity can be diffused like white light, or it can be a laser. Before we go, my log-line class will be TONIGHT Your Story in a Sentence—Crafting Your Log-Line . This class will include me gutting your log-line in class (or via e-mail if you’re shy) to make it agent ready. We should be able to tell others what our story is about in one sentence or odds are we have a big problem. Class is recorded and the recording and shredding are included. Also, due to popular demand, I am rerunning my Hooking the Reader—Your First Five Pages at the end of the month and I am doing something different. Gold Level includes me looking (and shredding your first five) but I have added in some higher levels and will look at up to 20 pages. This can be really useful if you’re stuck. I can help you diagnose the problems. It’s also a great deal if you have to submit to an agent and want to make your work the best it can be. I need all of this advice and plan to put it into action this very day. You may have heard similar things before, but here it is in a compact and dynamic version. What do you think? How do you manage time? What are the time-wasters you need to ID and purge? Reblogged this on Thinking… Thought. Thanks for this wonderful article full of wisdom. Keep ’em coming. I have so much trouble focusing on those boulders compared to pebbles. My time management skills are so crap. It’s something I really need to work on because there are enough hours in the day to do tons of stuff – I just get overwhelmed thinking about it (and me + schedules = disaster). 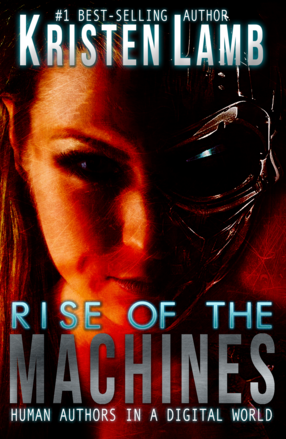 Am reading Rise of the Machines thanks to Nancy Rue. It’s been so helpful in building my author brand. I’m setting my goals and this will certainly be helpful. Awesome! Thank you ((HUGS)). And hugs to Nancy too! Time Management – we can never have enough of this and we can always improve. This particular article comes at a very opportune time in my life. We all have the same amount of time, what matters is how we choose to spend it. Great article that I think most everyone will benefit from reading. Don’t sweat the small stuff and do the hard stuff first when tackling a to-do-list has worked well for me. I learned the hard way, if I don’t set aside time for writing first thing every day, something always comes up. To achieve that; I get up earlier than the kids and sometimes when its still dark. You do what you have to do. Congratulations on the new stripe. You rock, Kristen! Cheers. Kat. I rise early, write early; that way I write every day. I keep a very tight budget with finances, but my time and energy budgets get out of whack. Thanks for the needed wake up call. Recently, I’ve had to make a complete change of what my boulders, my life goals, are. It’s daunting to go from homeschooling a kid while writing books and looking for agents/publishers to going back to college to get a degree in microbiology while continuing to homeschool said kid. But I’m learning to focus on tackling the small goals (re-learning quadratic equations) that will help my mid-range goals (complicated math and science-y courses) in order to accomplish the big goal (Get my MS in epidemiology and work for the CDC). I need to do this. I need to focus on a future in which I don’t have my husband to rely on while I write books. I need to focus on little projects, like re-learning algebra, to keep me sane while my husband suffers from terminal cancer. I need my goals because my goals make everything just a little bit easier. Reblogged this on WANDA S. PARYLA. I used to have a boss who said/asked “Are you busy or are you being productive?” Asking yourself that with every task you do at work is huge. Same thing with your writing – we ALL waste that precious writing time on email and BS that we could do at lunch, but we can’t usually write at lunch. That boss had a lot of good management tips I still use. Boulders are writing. Pebbles are fixing the website. Why do I need the site if I don’t write? Thanks for keeping me focused. Kristen is one of my favorite bloggers. Not only is she hilarious, she often digs out the gems of writing and day to day living that make life (and novels) easier!! Look out for the pebbles, people, and chip away at them boulders. Oh, this is so good! I think I will not only reread it, but actually take your advice 🙂 and start making some lists and some log-lines for life. By the way, have you come across the book “Essentialism”? I read it recently – it’s good stuff! I LOVE, LOVE, LOVE that book. Actually blogged about it. The Power of Habit, which he mentions quite often, is pretty darn good, too. If only it were as easy to do as to read about! Too much busy-ness stealing your fruit? Here’s some great advice from my Social Media Jedi Master, Kristen Lamb. Go ahead! Reclaim your dreams…one pebble at a time. Yes, too much busy-ness in our world. Of course, it’s always nice when a boulder drops on your shoulder. Sometimes, we have no choice what we focus our time on, but on the average day, we make the list. Thanks for imparting another dose of sanity and wisdom. I think, we all need to see this. Want to be a writer? Read Kristen’s blog! Today she reminds us that time is ours to use or waste – your choice! I love the common sense approach on time management. Time is equally distributed to everyone – here today and gone tomorrow. How many times have you said, “If I could only find more time, I would …” (fill in the blanks). Time is precious here today and gone tomorrow. Time is never lost, only wasted. Great post. I’ve also found that the earlier in the day that I tackle the boulders, the better, as the pebbles only seem to mount as the day goes on. And writing first of all. Great post. I’m guilty of the “if only I had the time”-thinking even though I sometimes notice I’ve again spent hours doing absolutely nothing. I’ll have to give the two separate lists a try and keep an eye out for opportunities to multitask when I’m on the phone or similar. This is truly amazing. Thanks for sharing your insight. You are an inspiration. All of this makes perfect sense. I’ve been making an effort NOT to multi-task. However, it’s a great idea to multi-task when it does not mess up the effectiveness of either task, like talking on the phone and cleaning the kitchen. I loved hearing the specifics of your day really helps…thank you! Not to try and hawk a book but in Rise of the Machines I lay out a plan where you could actually make all those horses pull on the same team 😉 . Hahaha hawk away. And you know what, I think I’ll go ahead and buy your book. I’ve got nothing to lose except a few dollars right (and I guess the time to read it)? Love this post! It hits right at home for most people like me! 😀 I’ve always known, yet only recently appreciated, that no time is never an excuse to do what you really want. If you want to get something done, you have to make time for it. In my life, I’ve come to apply the thought to two things–exercise and writing. I’m glad and thankful that you’ve taken the time to motivate others to spend their time more wisely. More power to you and your blog. Yes I was just thinking this morning that I would like to live outside the notion of time. I just want to be. Not like in a meditative way but just be in the moment always, or don’t do the thing that makes me watch the clock. Love this – “…time isn’t hidden in the couch cushions…”! Great post! I so needed to hear(read) this. Loved the Big Boulders and Pebbles analogy. Reblog Friday – Great Article on Time Management. Whether you’re a writer or not, these tips are helpful. If you want to do something enough then you will find the time to do it, despite all the other claims on your hours. There are so many things we don’t need to do – watching endless rubbish on television is one. If you have a family, then young children can disrupt the best of resolutions, but time should still be laid aside for things you as a person want to achieve. Several years ago, there was a fad for talking about ‘me’ time. Really important whatever you do with it. That could also be writing time. One should focus on what he or she love. Oh my gosh, this hits SOOO close to home. I manage my time using http://www.timecamp.com. I create a task for one week and than track their time in my mobile phone an computer. Very convenient solution. Have you tried this ?